I'm going to attempt to restart my blog. And in a move that I've been thinking about for a long time, I am moving the blog. I have decided that Tumblr will better suit my needs. I need a blog that is more mobile-friendly, both for view and for creating. Tumblr makes it easier to blog from a mobile device. Blogger has been good to me, but it is time to move on. I will keep the old contents here, and I will be linking to it from time to time. Oh, why do I even bother pretending that I'm going to be a better blogger. I'm thinking of changing the name of this blog to The Apologist. 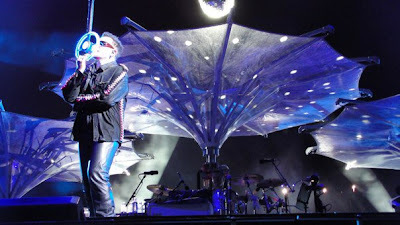 A couple of weeks ago I went to the U2 concert at Soldier Field, and it was of course spectacular. First of all, I had never been to Soldier Field before, so that was great in itself. But the concert had been rescheduled from last summer, so I had bought these tickets a year and a half ago. 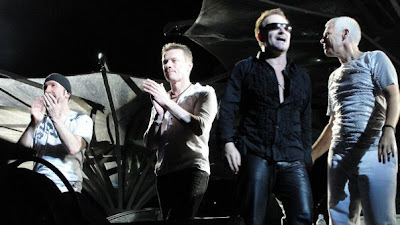 I saw U2 once before, back on the Achtung Baby tour in 1993, so it had been 18 years since I last saw them, and they have grown so big now--I was both excited and a bit apprehensive. 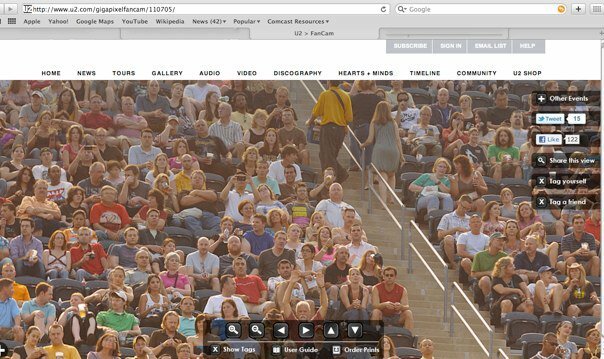 Of course everyone says they put on a great show, but I'd never been to a stadium concert before. But holy crap. What a show. The size and spectacle of their 360 set just has to be seen to be believed. Massive. Opening band Interpol played a great set, and then U2 came out, accompanied by David Bowie's "Space Oddity." The band then powered up with a stirring rendition of "Even Better than the Real Thing," and then just played one great song after another. One of the best albums ever, Achtung Baby, was heavily represented, which made me very happy. One of the unexpected highlights for me was the back-to-back of "Miss Sarajevo" and "Zooropa." "Miss Sarajevo" in my opinion sounds better without Pavarotti singing, and it was really just a beautiful moment. And while I've always love "Zooropa," it sounded especially lovely that night--maybe because I did not expect to hear it. The closing number of encore 2 was a real treat. I guess they don't play "One Tree Hill" very much, and have not played it for several years in the U.S. And everyone knows it is a near perfect song. 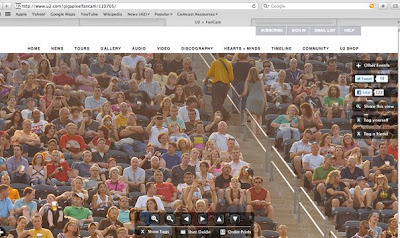 I did not have great seats--not bad, though. We had a good view, but we were just a little far away. But I got some good pics. The giant 360 degree screen above the stage helped with the view. Astronaut Mark Kelly introduced a song via a link-up (not live of course) with the International Space Station. My friend Lisa was in the second row, and she got some better pictures. That may be a bit of an understatement. Because I let my blog die for so long, I have missed out on some important album reviews. I will attempt to make up for all of these overlooked albums. This album was released several months ago, so I've had plenty of time to listen to it. Everyone knows that R.E.M. is my favorite band of all time, and with their last album, Accelerate, the band sort of returned to big rock and guitars, with excellent results. Early word on Collapse into Now was that the album would be very eclectic, pulling from many of R.E.M. 's sounds throughout the years. And that's exactly what it is--an album with some hard-rocking songs, some plaintive ballads, and some complicated melodies. One critic I read said that Collapse into Now sounds like R.E.M. doing cover versions of R.E.M. songs, but I think that is an unfair criticism. When a band has been around for 29 years, some sounds are bound to come up again. 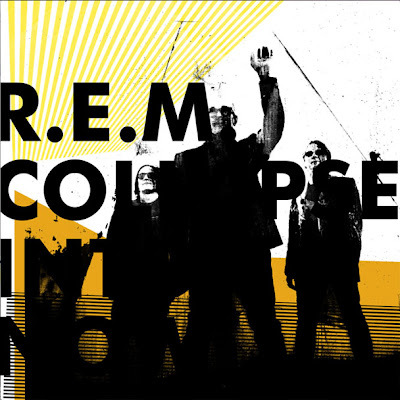 I think that Collapse into Now is a great album filled with some great songs, and yes, of course it sounds like R.E.M. It is R.E.M. As an added bonus, the band commissioned videos for each song on the album--some are "lyric videos," some are proper music videos, and some are short, abstract films. "ÜBerlin" is a strange and beautiful song. I've posted the video before, which features British actor Aaron Johnson doing a strange dance through the streets, and the band also released a rather hypnotic lyric video. This song features a very interesting verse structure, coupled with a soaring chorus that I can easily picture thousands of people singing along to at a concert. "ÜBerlin" is fantastic, one of the highlights of the album. "I am flying on a star, star, star." The strangest, most lyrically fun, most danceable song on the album is the brilliantly titled "Alligator, Aviator, Autopilot, Antimatter," which features back-up vocals by electro-goddess Peaches. (And the video is simply bizarre, but worth checking out.) I love the pounding beat, the yelling background vocals, and everything about the chorus. "Hey hey alligator, you've got a lot to learn." And one of R.E.M. 's most pop-rock love songs ever, "That Someone is You," just makes me smile. From the earnest feelings of the chorus to the references to "Sharon Stone, Casino" and "Scarface Al Pacino," this little under-two-minute song flies by in a rush of joy. "You pulled me up and out of cartoon quicksand." These are the highlights for me. Collapse into Now does not break new ground for R.E.M. Instead, the band has realized what they do best and put some fresh spins on it. Yesterday was the annual Chicago Pride Parade, which is always a fun time. The weather was beautiful--warm and sunny, but not too hot. I met up with my friend Lisa and a couple of her friends, staked out a nice spot under a tree, had a couple of cocktails, and watched the fun. The atmosphere was very festive, as usual, but people seemed extra excited about the New York marriage law, and that added to the celebration. We did not know at the time that more than 50 floats had their tires slashed overnight in an apparent hate crime of vandalism, but crews worked all night to repair more than 100 tires. The parade always features a lot of politicians--aldermen, state representatives, etc. But this year our new mayor Rahm Emanuel was at the front, followed by the governor and lieutenant governor, as well as our Congressman. It was nice to see the powers-that-be so supportive. And then came the floats, representing the flamboyant, the serious, the moving, the scantily-clad, and the fun. As always, it was a great day. A group of students, parents, and teachers from a local elementary school. A group of Chicago teachers. The tourism board of Tel Aviv, Israel, letting the world know that Tel Aviv is a great place for a gay vacation. Lots and lots of churches were represented, which was very heartening. The famous Dykes on Bikes. I did not mean for my blog to die. I got so busy with directing the musical, and with grad school, and then the end of the school year that I just sort of became overwhelmed. Just about every day I thought about posting something, just to keep the pulse beating here, but it became one of those situations where it became easier to not do anything than to make excuses and try to post something interesting. But I do not want to have a dead blog. I don't want to be a former blogger. As you might know, I directed the musical Footloose at my school, and this was my first lead directing gig on a musical. Everything turned out great--the kids were amazing, the crowds were huge, and the reception was wonderful (except for a few people who thought we were too "adult-themed"). I really loved working with the cast. Working with drama students is always interesting, always unpredictable. I cannot wait to do it again next year, even though it does take up so much of my time. The last couple months of school sort of flew by. I really liked my students this year (for the most part), and I had nice, tight-knit classes. School years here seem to go by much more quickly than when I taught in Minnesota, and I don't quite know why that is. But every year here seems shorter than the previous one. Well, it did not ALL fly by. Right after the play ended, I got walking pneumonia, which really laid me out for a lot of days. I was miserable, missed several days of school, and took quite a while to get my energy back. Finally, the last two classes of my grad program have been really solid. The professor was the same one I started my program with, and she really makes the coursework worthwhile, interesting, and fun. So for the last few weeks I've been working with a colleague putting together our "capstone" project, which is a parody of The Office, but set in a school. We've had a lot of fun making it, and I taught myself iMovie, and I'm very proud of the final product.
. . . and most importantly, I am finished with grad school now. The past two years have not always been good, with some real dud professors, but the program really came around. And now I am officially overeducated, with a Master's in English and now a Master's in Education. So I wanted to fill in what's been going on for the past few months as my blog has died. But consider this the pre-reboot. I'm going to make some big changes here at I Charge Laughing, one of which involves, you know, blogging. These last few weeks have been some of the busiest of my life, causing me to (once again) totally neglect my blog. I've been working on my second-to-last grad class, which I actually like quite a bit, but it is taking a lot of time. It's an Action Research class, and we have to do a lot of, well, research. It's interesting, and I love the professor (she was the professor for our first class and also our adviser), but it takes a lot of out-of-class time. On the other hand, we have not had to go to class for the past few sessions because it is an independent study kind of thing. And that not-going-to-class thing has been great because the rehearsals for the musical have been taking up all of my time. The show is this coming weekend, so this is production week, i.e., hell week. Directing my first musical has been very fun and rewarding, but very stressful. Footloose is a fun show with lots of great toe-tapping music, but it is far more complicated than we thought it would be. The music is surprisingly intricate, and the blocking and choreography have taken a lot of time. But the kids have been working hard, and it will be over soon. And then I can get back to grading papers.